An Internal Form is one of the 3 main types of forms that you can create for your Workspace. Use an Internal Form to create a form for use within your Workspace. An Internal Form, once created, will be associated with an Application Form in your Workspace. A tab will be created and appear in your navigation bar upon creation. An Internal Form is not accessible via a URL and is therefore not accessible by the public. Its usage lies more in managing internal notes and reviews surrounding an application. ONLY individuals that are members of your Workspace will have access to create or view the form - though we will discuss later how Workspace members could utilize internal forms to present or collect further information from applicants outside of the main Applicant Form. Click on the Manage Tabs in the upper right of your Workspace then click Add a Custom App. After clicking Internal Form, you will be brought to the page seen below. This window will allow you to formally create your new Internal Form. 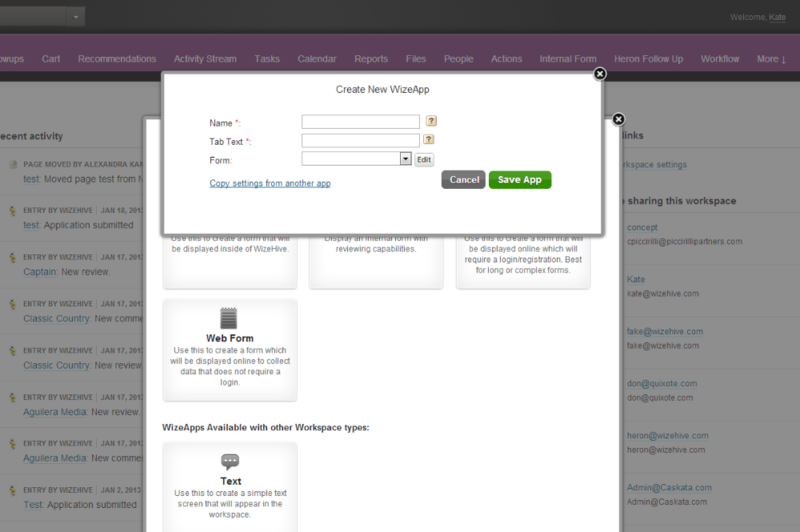 Give your Internal Form a name, name the tab the form will be associated with, and select a form or create a new form. Click Save App. Now Your Internal Form can be built. 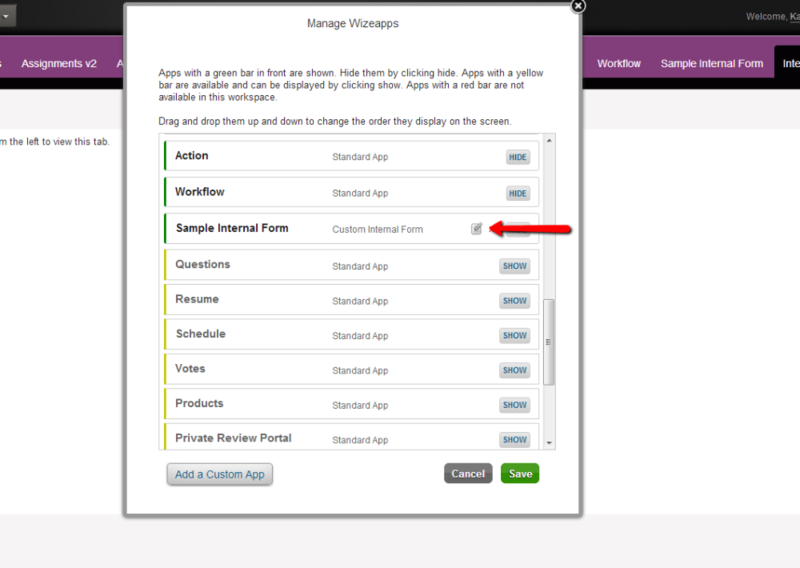 To edit your form, click on Manage Tabs in the upper right of your Workspace. Click the pencil and paper icon seen below. Alternatively, you can click on the Form Settings button inside the form's tab. You would like individuals to review the submitted Application and add additional information to be considered in evaluation. You would like to provide a means of determining whether the entry form that has been completed has been completed to the standards required for the program in question. You would like a way to demonstrate which applications are most suitable to continue on to the next level of processing. You want to score and provide comment on a form so that it can be updated before moving on to the next stage of the program. Who can complete an Internal Form?